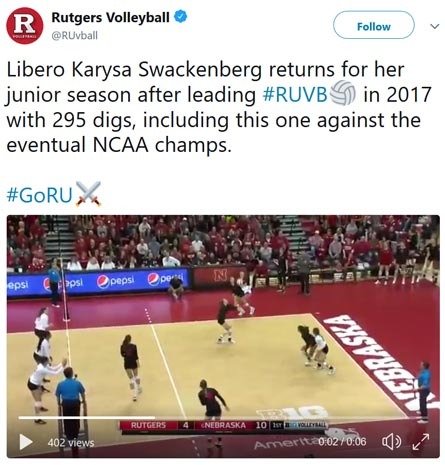 Flatirons alumni Karysa Swackenberg flying high at Rutgers Volleyball! Where have Flatirons players gone to college? Ong Ly: Pratt College, Kansas. Former Flatirons VBC player Andrea Tuck was named to the Rocky Mountain Athletic Conference All-Tournament team, and is now an All-American. Way to go, Andrea! LOUISVILLE  When Jeff Wolny became the volleyball coach at Monarch five years ago, he inherited a team that went winless the season before he arrived. The Coyotes went 9-10 his first year and began a building process that culminated in Monarch’s best season ever this fall. Of course, Wolny had some help. Senior Mandi Grasser emerged to lead the team in both kills and digs as Monarch won the program’s first-ever district title and advanced to regionals for the first time in program history. For their accomplishments, Grasser was named the Daily Camera’s Player of the Year and Wolny received Coach of the Year honors. Grasser led the Coyotes in kills with 318 and in digs with 314  both school records for one season. She also tied with Gwen Clark for the team lead in aces with 44. Athleticism runs in Grasser’s genes. Her dad, Dean, played football for Fairview, graduating in 1971. But it was her mom, Vicki, a graduate of Lincoln, who encouraged Mandi to play volleyball. “I love it now, so I’m glad she made me,” Mandi said. Grasser began her volleyball career as a setter. Last year she served as a middle blocker for Monarch before moving to outside hitter this year. 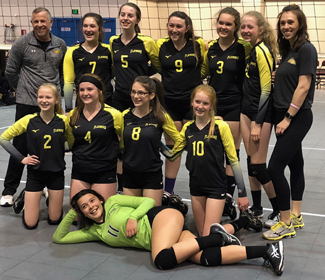 The transition from position to position was easy for her because of all her experience playing club volleyball for Flatirons Volleyball Club in Superior. Her leadership was vital to Monarch, as well, and she served as the team’s captain. Pam Johnson, Sr., Longmont, Opp. 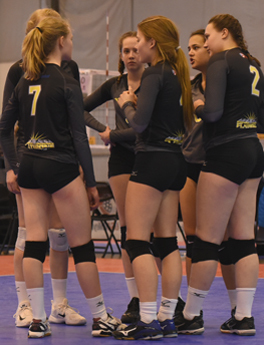 FLAGSTAFF, Ariz.  Northern Arizona University head volleyball coach Chris Campbell has announced the signing of three incoming recruits for the 2005 season. Emily Osiadacz (Ventura, Calif./Buena), Brittany Larson (Thornton, Colo./Horizon) and Alex Fell (Irvine, Calif/Northwood) will all join the Lumberjacks next year. Larson, a 6-2 rightside hitter, was a three-year letterwinner at Horizon High School where her team was second place in both the league and the district in her senior season. The team also earned its first-ever regional tournament bid this year. During Larsons junior year the team also placed second in the league, and came in first during her sophomore year. In 2003, Larson was invited to the USA High Performance Camp at the Olympic Training Center in Colorado Springs, Colo. Her former club team, the Norco Juniors, was ranked seventh nationally in 2003-04, and Larson currently plays for the Flatirons Volleyball Club 18 and under out of Superior, Colo.
Gabrielle Curtis, Ralston Valley senior, made nine kills and two aces in her final high school game, helping her team to a 22-25, 25-22, 25-14, 25-21 victory at the Colorado Coaches of Girls Sports all-state volleyball games. Curtis, who has signed to play at Metro State, ranked sixth in Class 4A with 70 aces, seventh in kills (284) and second in digs (299) while leading the Mustangs to the state tournament. RICHMOND, Va. – Virginia Commonwealth’s volleyball outside hitter Rachel Ross (Boulder, Colo./Boulder) received Colonial Athletic Association Volleyball Rookie of the Week on Monday, Oct. 20. The freshman earned career-highs and two double-doubles during a 2-1 week. Ross recorded seven kills and 14 digs in a 3-1 win over Radford on Tuesday, Oct. 14. She then posted her second and third double-doubles of the season in VCU’s two conference matches over the weekend. The rookie registered 13 kills and a career-high 19 digs in the Rams’ four-game loss to William & Mary on Friday. During a 3-1 win over the UNC Wilmington Seahawks, Ross tallied a career-best 14 kills and marked 14 digs. On the week, the freshman outside hitter registered 34 kills for an average of 2.83 kills per game and 47 digs for an average of 3.92 per game. VCU (9-15, 2-5 CAA) will travel to Harrisonburg, Va., to play conference foe James Madison (9-10, 4-3 CAA), for their lone match of the week, on Saturday, Oct. 25. The Rams will return to the Siegel Center on Nov. 7 & 8 for a pair of conference matches against Delaware and Hofstra. ERIE  Mail arrived nearly every day at the Tuck residence this past year from college programs trying to lure a skinny 6-foot-1 volleyball player from this small town to far-away places. Schools such as Florida and North Carolina made some of the strongest pitches for the services of outside hitter Andrea Tuck. But she spurned them all, instead signing last week with a rebuilding, but close-to-home program, the University of Wyoming. No one was more relieved than her mom and high school volleyball coach, Gaynelle Tuck, who stepped down after this season so she could see her daughters play collegiately. Breezy Tuck plays for Northeastern Junior College in Sterling and Cydell Tuck plays at Adams State. After watching Breezy join a junior college program and Cydell reach the Division II level, Andrea has climbed the highest, going to a Division I program. Other coaches, such as her club coach, Susan Cancilla (a Fairview assistant), say Andrea could have gone to a more prominent volleyball program. Wyoming coaches have told Tuck she may start next year, after she led Erie in four of five statistical categories with 340 kills, 51 blocks, 181 digs, and 32 aces. Tuck was also recognized as one of the best players in Class 3A at Sunday’s all-state games. The recognition doesn’t end there. Andrea Tuck earned this year’s Daily Camera Player of the Year honors, as well. Then again, she grew up playing with older sisters who were successful in the sport. Actually, she does know something different. She knows what she wants, and that’s to move to the windy city of Laramie for the next four or five years.